Moll Flanders is a large-than-life character whose drive for love and survival uncovers the influence of gender, class, free will, and circumstance in Milwaukee playwright Marie Kohler's stage adaptation of Daniel Defoe's 18-Century novel. 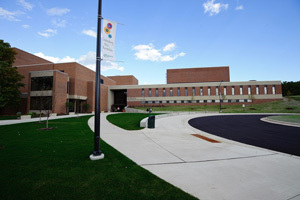 Rita Tallent Picken Regional Center for Arts & Humanities anchors the west side of campus. "The Rita" features theatres, art galleries, classrooms, rehearsal halls, Fireside Theatre Scenic Studios and the magnificent Frances Bedford Concert Hall.